The Vatican’s recent snub of Secretary of State Condoleezza Rice is only the latest salvo in the battle between Pope Benedict XVI and President George W. Bush. This tug of war has profound implications for both U.S. foreign policy and the critical Catholic vote in 2008's presidential race. On issues ranging from the war in Iraq to global warming, the Vatican and Washington have not seen eye to eye. With the popularity of U.S. foreign policy at record lows around the world, however, the Vatican’s diplomatic approach is more consistent with global public opinion. Things haven't always been tense between Bush and Benedict. They share similar views regarding abortion, gay marriage, and other hot-button conservative issues. 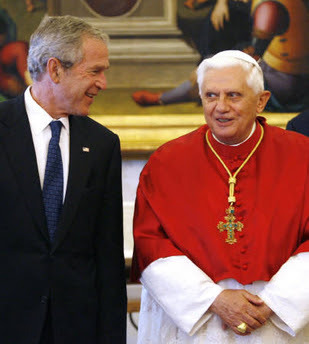 Cardinal Joseph Ratzinger (as Benedict was known before becoming Pope in April 2005) even helped Bush secure the White House for a second term. Specifically, after Bush visited the Vatican in June 2004, complaining that "not all the American bishops are with me," Ratzinger sent a letter to U.S. bishops, ordering them to refuse communion to "a Catholic politician … consistently campaigning and voting for permissive abortion and euthanasia laws" – a thinly-veiled reference to John Kerry. Ratzinger added that any person even voting for this Catholic politician “would be guilty of formal cooperation in evil and so unworthy to present himself for Holy Communion." Probably no surprise, then, that Bush increased his margin among Catholics by 6% from 2000 to 2004. In an interesting twist, Ratzinger also partnered with George W. Bush's brother Neil in a foundation "to promote ecumenical understanding and publish original religious texts" in 1999. Oddly enough, business credit reports listed the foundation as a "management trust for purposes other than education, religion, charity or research," leaving the true nature of the Neil Bush/Cardinal Ratzinger venture unclear. In 2005, Ratzinger was named as a defendant in a U.S. lawsuit suit accusing him of conspiring to cover up the sexual abuse of minors. At the center of the controversy was a May 2001 confidential letter he had sent Catholic bishops across the world ordering them to keep evidence of the sexual abuse of minors by clergy secret until 10 years after the child had reached adult status. Soon after becoming Pope, however, Ratzinger was dismissed from the case. A U.S. federal judge decided the lawsuit would be "incompatible with the United States' foreign policy interests." In many contentious issues since then, Pope Benedict XVI has disagreed with the Bush administration's policies, but only politely and indirectly. For example, Benedict has spoken in favor of the International Atomic Energy Agency, which is often at loggerheads with Bush administration foreign policy. Similarly, Benedict's Vatican has taken a firm stance against global warming, even acquiring a carbon offset forest to make the Vatican the "first entirely carbon neutral sovereign state." The Pope has called for greater international co-operation to fight ozone depletion, yet not overtly criticized White House foot-dragging in that area. The gloves came off, however, regarding the war in Iraq. In a May 2003 interview, Ratzinger said, “There was not sufficient reasons to unleash a war in Iraq. To say nothing of the fact that, given the new weapons that make possible destructions that go beyond the combatant groups, today we should be asking ourselves if it is still licit to admit the very existence of a 'just war.'" The U.S. invasion of Iraq was similarly contentious for former Pope John Paul II, who sent a special envoy to the White House in March 2003 in an effort to prevent an attack. 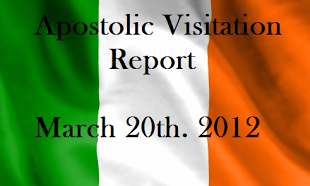 The papal envoy's pleas fell on deaf ears. Vatican criticisms of the Bush administration’s military intervention in Iraq have continued unabated. French Cardinal Jean-Louis Tauran, head of the Pontifical Council for Interreligious Dialogue, told an Italian magazine in August 2007, "The facts speak for themselves. Alienating the international community (with the U.S. push for war) was a mistake." Tauran, who has referred to the invasion and occupation as a "crime against peace," also said that Christians in Iraq "paradoxically, were more protected under the dictatorship" of Saddam Hussein. As such, it is perhaps unsurprising that Benedict failed to honor Secretary of State Condoleezza Rice's urgent request for a private meeting. The Italian periodical Corriere della Sera reported that Rice was hoping to capitalize on the Pope's moral authority by having a papal audience focused on the Middle East. Instead, Rice was told that Benedict was on holiday and had to settle for a telephone conversation with a lower Vatican official. The ongoing tensions between Bush and Benedict over Iraq put America's over 75 million Roman Catholics in a tricky position for 2008. By supporting candidates hawkish on the Bush administration's Iraq policies, are they defying the Pope and the Catholic Church? In other words, being dovish on Iraq might help the next Democratic presidential contender win Roman Catholic votes. Whether the current front-runners qualify for that distinction, however, is another matter.